23A [Early 2010s foreign policy controversy often cited by Clinton detractors] BENGHAZI SCANDAL. 35A [Arrangement with a mobile phone carrier regarding messages] TEXTING PLAN. 52A [Stop abruptly] COME TO A HALT. 89A [Pertaining to syndromes that affect both the heart and kidneys] CARDIORENAL. 105A [Chairman of the Federal Reserve from 1979 to 1987] PAUL VOLCKER. 121A [Construction worker of the 19th century] RAILROAD BUILDER. So what gives? I know next to nothing about football, but I’m relatively sure the BENGHAZI SCANDAL is unrelated. However, once you see BENGAL hidden in those words, it’s hard to unsee. A quick look at the title NFL Divisions and the rest of the theme answers provided the first 67-Down moment (the apt clue for which is [Meta solver’s cry]). A player for 7 different NFL teams can be found “divided” in each of the across themers. Cool! In fact, if Evan had just circled those letters and left the puzzle at that, it would’ve been just fine, given the title. But he took it a big step further. What team is hinted at? This part is tougher to figure out, but brings yet another satisfying 67-Down. Cincinnati is home to the Bengals. Then there’s the Houston Texans, Indiana Colts, Cleveland Browns, Arizona Cardinals, Green Bay Packers, and finally the Oakland Raiders. The first letters of each of the locales spells CHICAGO, which of course is home to our meta answer: DA BEARS. I really liked this meta! I figured it out whilst tending bar. 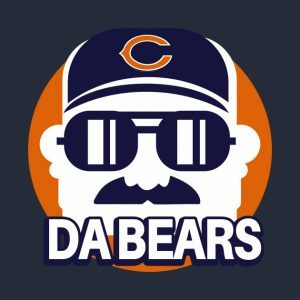 After writing the full team names down on a cocktail napkin, I saw CHICAGO quickly, and triumphantly cried “Bears!” to no one in particular. When patrons asked what was wrong with me, and I explained the puzzle, they were blown away. 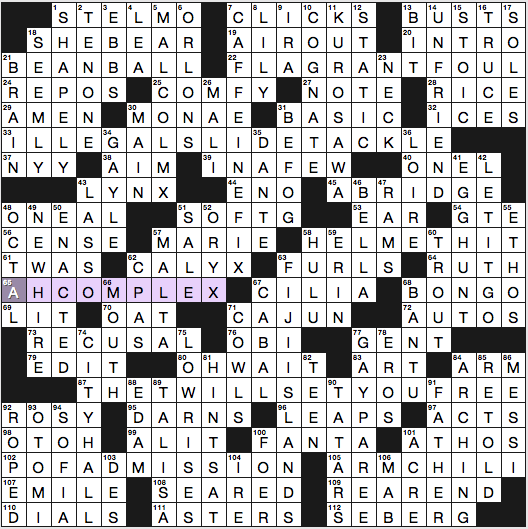 I love showing people how creative crossword puzzles can be. CARDIORENAL was new to me as a term, and I’d never heard of PAUL VOLCKER, but the former was easy to infer based on the clue and the latter was fairly crossed as to avoid Naticks. RAILROAD BUILDER seems quite vague as a term, but in order for the meta to work, it was necessary to end with the Oakland Raiders, and the only other answer I could find to fit using a OneLook search was RABID WOLF SPIDER. Haha! I’ll take RAILROAD BUILDER. 38D [Employing the secret service?] ELOPING. There’s lots of cute ways of cluing ELOPE, but I have to say this stands out as my favorite. 40D [Drawing locale of old?] WILD WEST. Hehe. 49D [It published an article in 1999 titled “Archaeological Dig Uncovers Ancient Race Of Skeleton People”] THE ONION. Always fun to read those headlines. Here’s the accompanying article. 4.5 stars from me! Lots of fun. Happy Super Bowl Sunday, everyone! May the ads be worthwhile and your boxes hit for all for all four quarters. 119A [Mario Party party] LUIGI. 21a. [Reason for an ejection in the M.L.B. ], BEAN BALL. Yes, that is what you call that offense. Does anyone say “the MLB,” though? It feels wrong to me, with the definite article there. 22a. [Reason for an ejection in the N.B.A. ], FLAGRANT FOUL. 33a. [Reason for an ejection in FIFA], ILLEGAL SLIDE TACKLE. 58a. [Reason for an ejection in the N.F.L. ], HELMET HIT. Then you have four athletes, one from each sport, clued via cross-reference to a theme answer in the bottom of the grid. Hang on while I find RUTH, because I filled him in through the crossings. 28a. [N.F.L. star ejected from 102-Across], RICE. 102a is [Entry fee], or P OF ADMISSION, which is price of admission with Jerry RICE “ejected.” Anyone know if the athletes whose names are extracted from themers were guilty of those fouls? 48a. [N.B.A. star ejected from 105-Across], O’NEAL. 105a is [Stew that’s decidedly not very spicy], or ARM CHILI, one-alarm chili minus Shaquille O’NEAL. 64a. [M.L.B. star ejected from 87-Across], RUTH / 87a. [Seeming opposite of “Ignorance is bliss”], THE T WILL SET YOU FREE, with truth losing Babe RUTH. 86d. [FIFA star ejected from 65-Across], MESSI. Three Across jocks, one Down. 65a. [Belief in one’s role as a savior], AH COMPLEX, messiah complex minus Lionel MESSI. There were a couple tough crossings of not-super-familiar proper nouns and the parts of themers where letters had been ejected. 93d. [People of south-central Mexico], OTOMI, meet the spot where RICE was gone. Don’t complain that Natan put OTOMI in his puzzle—be mad that the Mexican government generally focused on the Aztecs and Mayans to the exclusion of other indigenous cultures that hadn’t gone away. Then there was 89d. [___ Stark, Oona Chaplin’s “Game of Thrones” role], TALISA, with the T in the RUTH-less spot. That character was on seasons 2-3, and the 9th and final season starts this spring. Even if you dig pop culture, I hereby excuse you from needing to know this TALISA. 9d. [Writer/critic ___ Madison III], IRA. How exciting! A new IRA clue. I gather that Mr. Madison was an early adopter of Twitter, as his handle is simply @ira. And yes, he’s aware that he’s in the clue. It’s adorable. 5d. [Organization of Afro-American Unity founder], MALCOLM X. Great entry. Makes up for the dull Downs immediately preceding it. Among the sparkle in the fill, we have: Janelle MONAE, pretty botanical word CALYX, CAJUN (71a. [English dialect in which “food shopping” is “makin’ groceries”], huh, did not know that), CAFFEINE FIX, Akira KUROSAWA, UNFRIEND, NEW HIRE, CITY HALL, and LOW-RISES. Didn’t we recently have a daily puzzle with a similar theme? I’m too tired to look it up but I am pretty sure we did. Five nights, three hotels, two days of meetings, one presentation, two days with my kid, and one harrowing drive from San Diego to Long Beach in driving rain and gale-force winds with the tire inflation alert going off in the middle….it’s been a great trip overall and I’m ready to go home tomorrow. Meanwhile, there’s this puzzle. I liked the theme – it was fun and well-executed – but the overall quality of the fill took it down several notches. It was obvious from the beginning that something funky was going on with the theme answers. 26a [Royal title] should be HIS MAJESTY, which is four letters too short. I thought there was a rebus. Nope. 28d, crossing the last letter, is unclued because the theme answer makes a 90° turn, and we have HIS MAJESTY THE KING. 40a [First hit, perhaps] is DEBUT SINGLE. 59a [Fred or George Weasley] is an IDENTICAL TWIN. OK, we’re talking about bed sizes. 83a [Kids’ summer fun spot] is SLEEPAWAY CAMP. Hmm. CAMP is not a bed size, but a CAMP bed is a thing. 04a ]War hero/actor who played himself in “To Hell and Back”] is AUDIE MURPHY. I hope this was the seed entry for the puzzle, because it was my favorite theme entry. I love the idea of a MURPHY bed and hope to have one someday, just because. We also have a revealer: 118a [Item on the housekeeping checklist, or a hint to completing five puzzle answers] is TURN DOWN THE BED. Very nice. But the fill. Oy. Plural CSIS, plural APRILS, plural ENDIVES, I’D’VE, ERE, EEC, ORI (as a partial Shakespearean quote), ATRI, ATA, OWS, OON (as a suffix, because how else? ), TIE A for [Words with bow or scarf], NETH (abbreviation no one uses for The Netherlands), and more I’m too tired to list. Ugh ugh ugh ugh. 63a [Brush fire op] is an operation, or EVAC. I read that first as [Bush fire op] and thought of good ol’ George W clearing brush on the ranch. 97a [Amphibious assault troop carrier] is an AMTRAC. I of course put a K on the end without looking at the definition, and then stared at KORDITE and knew that wasn’t right. This is a pretty dang obscure word. The definition is the fifth hit on the Google search page because even when told not to, Google puts AMTRAK first, and there’s also a musician named AMTRAC. 115a [Kinda-sorta cousin] is ISH. Cute. What I didn’t know before I did this puzzle: that the TV series “The Untouchables” was filmed at DESILU studios. This entry was posted in Daily Puzzles and tagged Evan Birnholz, Natan Last, Pam Amick Klawitter. Bookmark the permalink. 81a [Straight, at a bar] NEAT. These are not synonyms. Straight is iced then strained, neat is poured direct from the bottle with no adulteration of any sort. Jim certainly knows this; I presume he simply missed the little 4-letter non-theme entry while multitasking. Similarly, MW11C has “straight” as simply “unmixed” and “neat” as “free from admixture or dilution: STRAIGHT.” Speaking only for my own sense of familiar speech, never having ended bar, I’ve never myself asked for something “straight,” but I’ve often felt comfortable speaking of “straight up,” and if the bartender had first poured the drink over ice, I’d have been pretty upset. You sure your customers were ok with you? Proverbially, after all, they are always right. While m-w indeed lists straight (adj) 3c as “free from extraneous matter: unmixed”, the accompanying usage example “straight whisky” indicates that this is referring to the distilling process (as per my comment below). I always chill drinks that are ordered “straight up.” Neat is always direct from bottle. But come to think of it, I don’t think anyone has ever requested “straight” without “up” being attached to it. I think I’d ask if they wanted it chilled or not if that were the request. Didn’t really consider it too deeply mid-solve. I agree too, I think. This is probably a misapprehension but I’ve always assumed the typical ‘straight up’ indicated chilled and in a cocktail (read: ‘martini’) glass. An unqualified ‘straight’ seems quite ambiguous. And we aren’t even talking about the distilling process (i.e., Kentucky straight bourbon). I mentioned this on Twitter, but I would be pretty surprised if Jerry Rice was ever ejected from a game for a helmet-to-helmet hit. Rice was a receiver, so he would be far more likely to be the victim of such a hit. Likewise, Shaquille O’Neal is known for repeatedly *being fouled* intentionally, and there was even a name for this strategy: Hack-a-Shaq. Maybe he was ejected for a flagrant once, I dunno. Babe Ruth could have been ejected for beaning somebody, as he was a pitcher in his early career. I know he was once ejected for arguing balls and strikes after walking the first batter of the game; the pitcher who relieved him picked off the runner and retired the next 26 batters in a row for a perfect game that didn’t count as a perfect game. Also side note: interesting to get a soccer guy but no NHL. In the U.S., MLB/NFL/NBA/NHL are usually thought of as The Big Four. This puzzle was a little tricky for someone who is not American and doesn’t follow American sports. I don’t know about these various rules. But I do know of RUTH, ONEAL, and MESSI. RICE? Guess he must be somebody, he was obvious once the theme was clear but I have no clue who this might be. 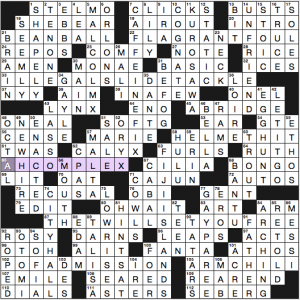 Good aha moment for me, I enjoyed the puzzle. Jim Rice played in the outfield with the Red Sox in the ’70s and ’80s. Had a good career, was MVP in the American League one year, and is in the Hall of Fame – although he was not voted in until his fifteenth and last year of eligibility. I have a Jim Rice signed baseball. But of course the Rice in the puzzle is the great football player Jerry Rice. I was dreading the NYT because of sports, although it was the soccer that was most obscure to me. I didn’t know its illegal move (or, for that matter, recognize FLAGRANT going with FOUL), and I’d never have got MESSI or for that matter OTOMI and TALISA had a not eventually stumbled on the theme. Come to think of it, I don’t remember the Orlons, which cross MONAE. So uninviting fill for me all around. The theme did grow on me, though, and I had no trouble finishing. At first it just seemed confusing and inconsistent, what with some about fouls and some about letter ejections, then others in shorter fill. But eventually that seemed clever. I wouldn’t know at this point how to rate the puzzle. I’m with Amy that “the MLB” sounds wrong. But when I do a search on the Google it does get some hits. 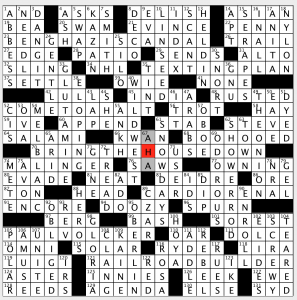 One L is a crossword staple; it’s the relatively common term for a first-year law student. Scott Turow’s autobiographical debut (1977) had that title as well. A “One L” is an introductory law student. I enjoyed the Washington Post meta even though 1) I’m not a sports fan and 2) I didn’t manage to figure out the whole meta. I did get all the team names but then I got lazy and gave up. Anyway, bravo to Evan for a fun puzzle! Evan got his own meta wrong. (How first letters of “divided” teams is hinted by, or relates to, the theme is beyond me.) The proper answer is the JA cksonville ja GUARS. Go Rams, or more aptly, die Patriots! I’ve read and reread your criticism, and I don’t understand what you mean at all. Can you be more specific? By that logic, the SEAttle seaHAWKS would also be acceptable, and arguably preferable. But neither is correct. Yes, Seahawks works as well (why it’s preferable I don’t see) and both are better than Evan’s answer which, again, has no relation to his note hint that I can see. 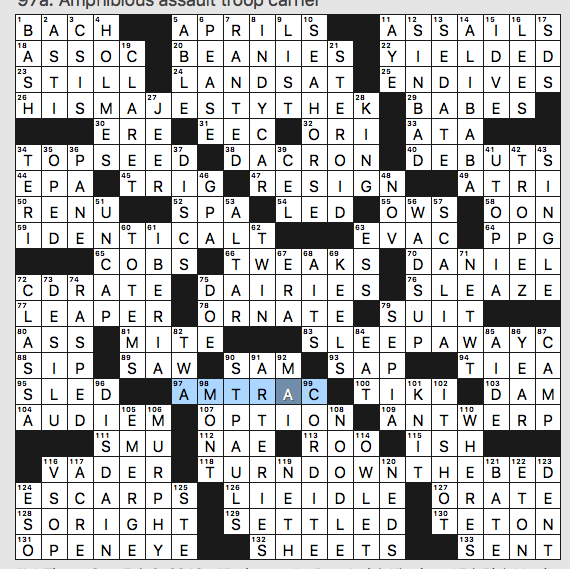 Arguably preferable inasmuch as crosswords tend to frown on two-letter entries (JA). However, the existence of two teams with this property further weighs against either being the meta answer. The initial letters of the locations of the teams—in theme-answer order—is unmistakably the intended answer. 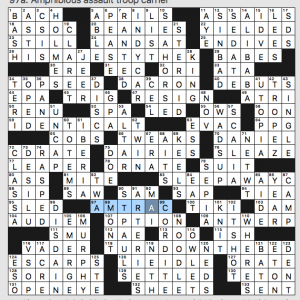 One might argue that proceeding through multiple steps like that is not adequately described as being “hinted at by this puzzle’s theme”, but it certainly isn’t the “wrong” answer or an improper one. Of course the intended answer is Evan’s. When I said he was wrong I was being hyperbolic. “Not adequately described ” would be better put as unconnected, off, poor. Seahawks has two words as I pointed out but what argues against my answer is that Jaguars is in Jacksonville Jaguars which isn’t the case for the teams in the theme answers. Having looked at the puzzle again, I think you can argue Seahawks is not acceptable, or at least not as acceptable as Jaguars, as no team is broken into two words. In fact, “an” and “own” are the only words in the bunch. Yes, “guar’ is a word. We all know that guar is a word. Anyway, the inconsistency of the separated bits—length, whether it’s a word unto itself—only further cements the idea of Jaguars or Seahawks as a non-viable answer. To my thinking, it’s a dead end, a quasi-interesting novelty. Ja Guars not only works but is a better answer due to Evan’s note which, as I said, has no connection to his answer that I can see. What’s to be lost about? I simply restated my position from the start: My answer is better than Evan’s because it works like the theme answers whereas his doesn’t and, as far as I can see, has no relationship to his note. How does the theme hint at using the first letters of the divided teams’ cities? You can argue Ja Guars is lacking but not as much as Chicago from my view. The moment appears to be too much for Jared Goff. Finally got around to these comments and just got a great laugh out of you sincerely claiming your answer is better than mine, even though you can’t spell JAGUARS with the first letters of either the team names or the NFL cities. But you do you. You miss my point. My answer isn’t better than yours because of how you worked the meta (which is fine and has been done before in different variations) but because of your note/hint that has absolutely no connection to it as far as I can see. 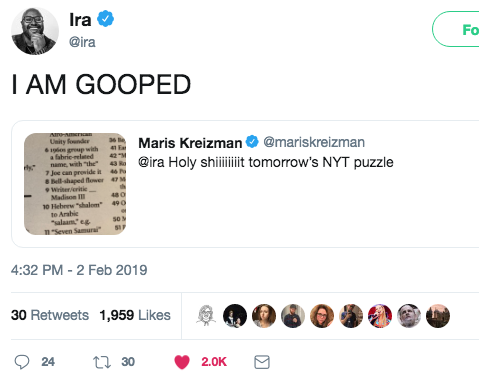 Put another way, your hint renders your meta absurd from a solver’s POV (who relies on such hints to set them on the correct path) whereas my answer is both hinted at by, and related to, the puzzle’s theme. If you gave us a different hint or no hint at all I wouldn’t be making this argument. I meant first letters of the “divided” teams’ cities, of course.